and an Afterword by Marlee Matlin This Signet Classic edition includes a facsimile of the Braille alphabet, a sign-language alphabet, and a full selection of Helen Keller's letters. "The greatest woman of our age." --Winston Churchill "Helen Keller is fellow to Caesar, Alexander, Napoleon, Homer, Shakespeare, and the rest of the immortals. . . . She will be as famous a thousand years from now as she is today." 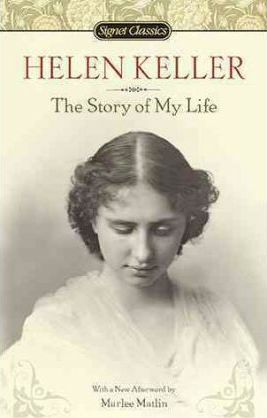 Helen Adams Keller (1880-1968) was born in Tuscumbia, Alabama in 1880. As a result of an illness, she became deaf and blind at the age of nineteen months. In 1887, her learning began with her teacher, Anne Mansfield Sullivan, and at the age of nineteen, she entered Radcliffe College, from which she graduated in 1904. A well-known lecturer and writer, she published her autobiography, The Story of My Life, in 1902. Her other works include Optimism (1903), The World I Live In (1908), and The Song of the Stone Wall (1910). Marlee Matlin received worldwide critical acclaim for her film "Children of a Lesser God," for which she received the Academy Award for Best Actress, becoming the youngest recipient of the Best Actress Oscar and only one of four actresses to receive the honor for her film debut. Since then she has gone on to star in numerous film and television roles. In 1994, she was appointed by President Clinton to the Corporation for National Service and she currently serves as spokesperson for The American Red Cross as well as on the boards of a number of charitable organizations, continuing to advocate on behalf of children and people with disabilities. She has authored three novels for children, Deaf Child Crossing, Nobody's Perfect and Leading Ladies and in 2009, published her New York Times bestselling autobiography I'll Scream Later. Jim Knipfel is a staff writer at New York Press, as well as the author of Slackjaw and Quitting the Nairobi Trio.